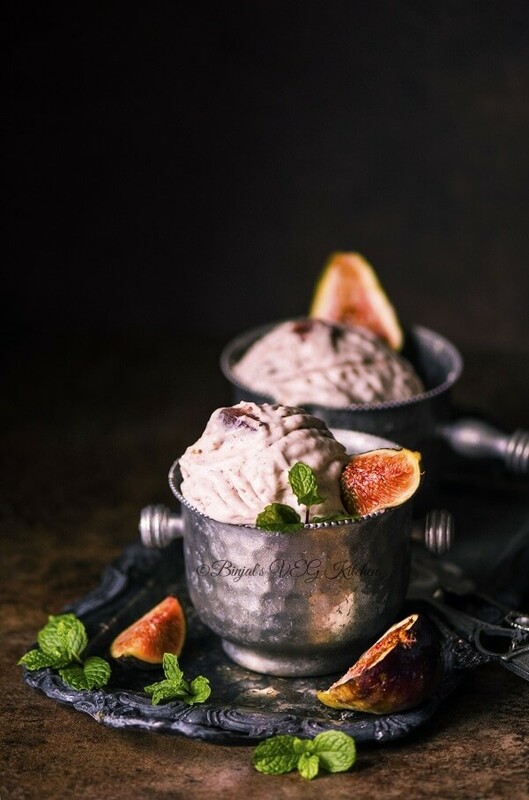 This homemade Fresh Fig Ice Cream recipe is a simple and delicious. Fig Ice Cream is a great way to showcase the color and deep flavors of ripe figs. 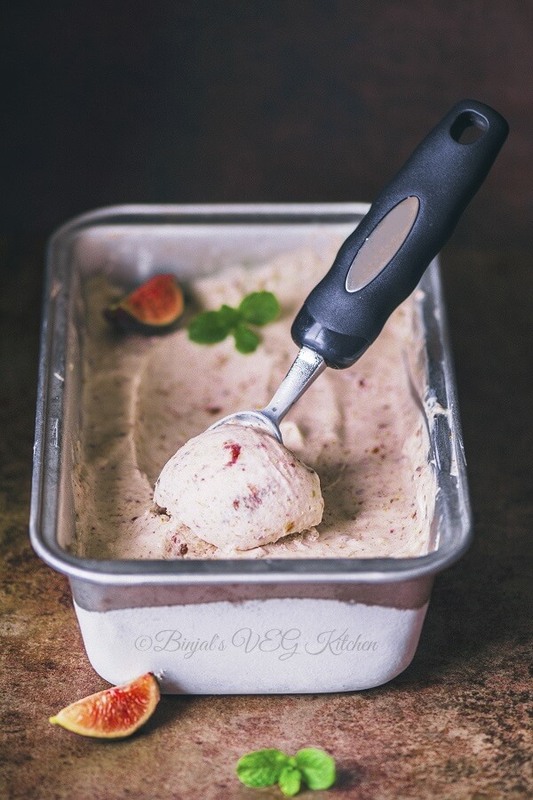 Fig Ice Cream is a very easy, no churn, egg free and no need any ice cream maker machine for making this yummy dessert. Fig Ice Cream is the perfect dessert for late-summer figs. I know summer is ended and fall is started, but still fresh figs are available in a market and for me ice cream do not need any season. It is a popular ice-cream at many buffets as well as parties. This is a gorgeous rich ice-cream and must for all these who love fruits. 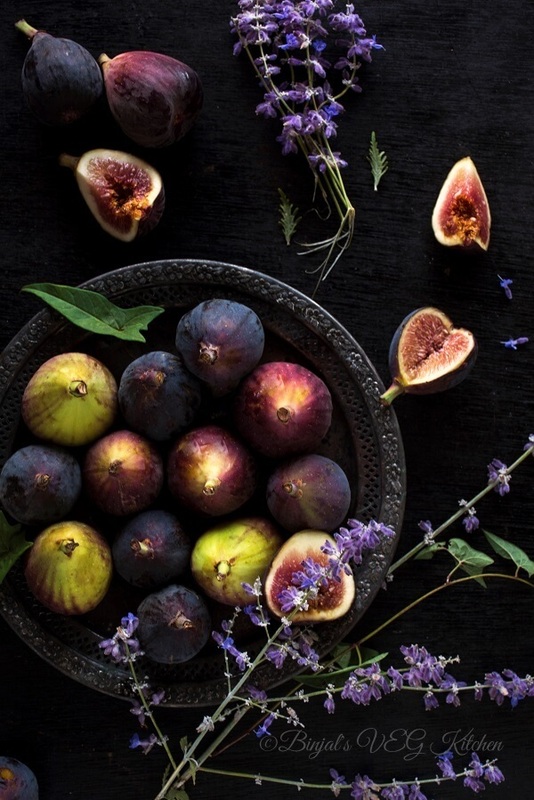 Figs are rich in fiber and iron, and both these nutrients play an important role in our diet. Serve small scoops, as this is a very rich ice-cream. 1. Whisk the whipping cream in a mixing bowl till foamy texture. It will take 7-8 minutes. 2. Add milk, cream cheese and mix well, then add vanilla extract, sugar and again mix till smooth creamy texture. 3. Now cover the bowl and place it into a freezer for 1-2 hours. 1. Wash figs, remove the steam and cut them into quarters. 2. Add chopped figs into the sauce pan. Add sugar, lemon juice, orange zest and water. 3. Mix it well and cook the fig mixture till soft and thick like jam texture. It will take 7-8 minutes for cooking process, after that switch off the flame and keep aside for cooling or till basic ice cream done. 4. Remove the prepared ice cream from the freezer after 1-2 hours. 5. Add prepared ice cream in a blender or mixer. Add ¾ part of fig jam and blend it for 2 minutes or till mix it properly. 6. Add remaining fig jam into the mixture, mix it very well with spatula. 7. Pour the mixture into the ice cream tin or container and set them again into the freezer for 4-5 hours till mixture become hard like ice cream form. 8. Once done serve it with fresh fig wedges or garnish it with mint leaves………and enjoy homemade fresh fig Ice cream. • You can add condensed milk into the basic ice cream mixture instead of milk and sugar for best result. • You can use brown powder sugar instead of regular powdered sugar. • You can use dried fig, but you have to need soak them for overnight or 4-5 hours till soft. • Orange zest is an absolutely optional ingredients you can skip if you don’t like it. • Adjust sugar level as per your taste. This homemade Fresh Fig Ice Cream recipe is a simple and delicious. Fig Ice Cream is a great way to showcase the color and deep flavors of ripe figs. 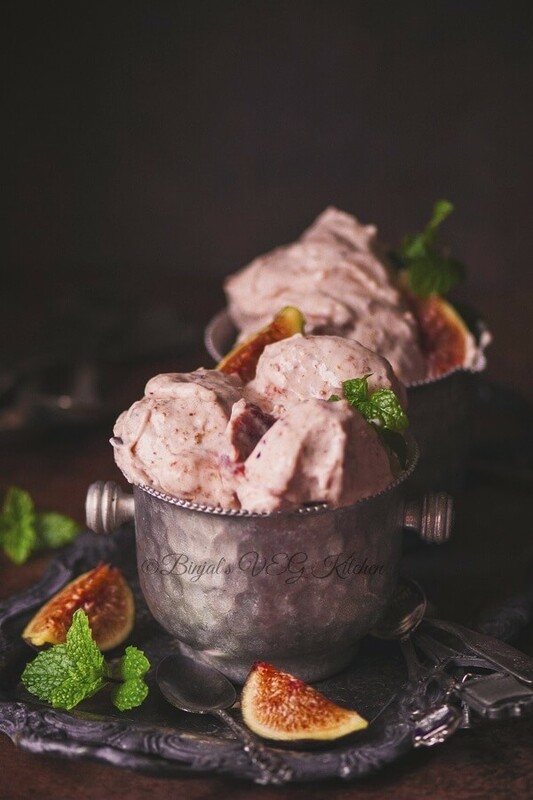 Fig Ice Cream is a very easy, no churn, egg free and no need any ice cream maker machine for making this yummy dessert. Fig Ice Cream is the perfect dessert for late-summer figs. 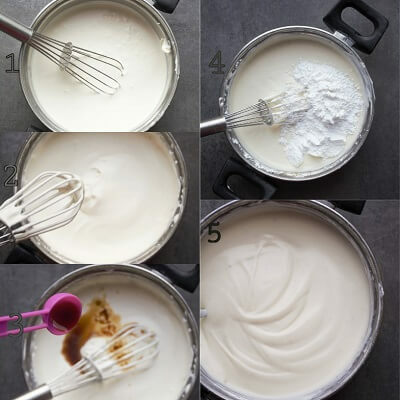 Whisk the whipping cream in a mixing bowl till foamy texture. It will take 7-8 minutes. Add milk, cream cheese and mix well, then add vanilla extract, sugar and again mix till smooth creamy texture. Wash figs, remove the steam and cut them into quarters. Add chopped figs into the sauce pan. Add sugar, lemon juice, orange zest and water. 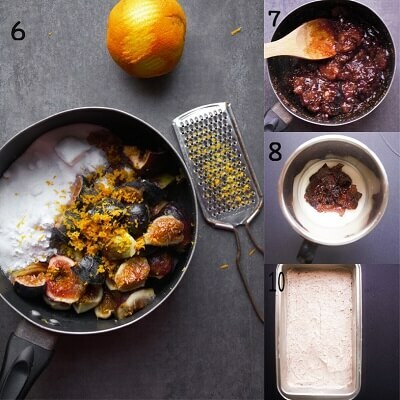 Mix it well and cook the fig mixture till soft and thick like jam texture. It will take 7-8 minutes for cooking process, after that switch off the flame and keep aside for cooling or till basic ice cream done. Remove the prepared ice cream from the freezer after 1-2 hours. Add prepared ice cream in a blender or mixer. Add ¾ part of fig jam and blend it for 2 minutes or till mix it properly. Add remaining fig jam into the mixture, mix it very well with spatula. Once done serve it with fresh fig wedges or garnish it with mint leaves………and enjoy homemade fresh fig Ice cream. yes its good!you won’t get any problem! Binjal.. Lovely pictures! Too tempted to try this one!! Had a query, if i am substituting milk+sugar for condensed milk, what should be the proportion of condensed milk? Also, what would give a better result of the two? thanks!!yes! Neha you can use 2cup milk+1cup sugar and boil it till remain half quantity, then use as a condensed milk. Hi my dad is into garment business. I love your pics can you let me know the Photographer name we would love to work with them for our products. I could have figs everyday, that much I love them. But, I am yet to have figs ice cream. How did I miss this?! Saved and pinned! Always loved your photogrpahy! This one is just fabulous! Stop it. You’re making me HANGRY! wowza! gorgeous photos, I sure do wish there were some figs left in the tree to make this but thanks to the squirrels they are all gone. You are doing some amazing photography here! I pinned your photos to 2 of my boards, love them and this recipe! My mum’s a big fan of anjeer. What with her birthday coming up, this icecream seems like the perfect thing to surprise her with. Thanks for sharing! thanks Spatula in my pocket! Ooh, I’ve admired this before somewhere. The ice-cream sounds amazing, but your photographs are exquisite. I love figs, this ice-cream looks incredible! Fig ice cream!!! I love everything about fresh figs, but this recipe takes them to a whole new level! My husband love figs, I will have to make this for him. Gorgeous photos. This ice cream looks amazing! Beautiful pictures too! Figs are my weakness and I would do anything to have this ice cream. Yum. Loved the pictures too. This recipe sounds heavenly, and what beautiful photos! Sounds wonderful! I just tried figs for the first time a month ago. Loving this recipe! Beautiful photos and fantastic ice cream! I’ve never had fig ice cream before, but I can only imagine how great it tastes. I can’t wait to try this! can we use dry figs?if yes ,then how? yes you can just soak them into the water for 4-5 hours or overnight, boil it into the water for 10 minutes, then use same process!! I love figs! This looks great! And your photos….. amazing!!! And your dishes….. I want.. I mean I NEED! Beautiful!